We also accept one-time donations for our orphanages. Sponsors receive pictures and biographical information on the child they support, and at least once a year receive a CD with a video interview, as well as a letter from the child. $100/month. Full sponsorship includes food, medical care, clothing, and education. Our easy communication will allow you to build a lasting relationship with your child. $45/month. This will cover any food expenses for your child. Food is not only costly, but sometimes difficult to come by in the Zimbabwe economy. $35/month. This will cover monthly school fees and also provide your child with their school uniform and other clothing needs. These kids will receive an education from one of our 27 Bible-based schools. $20/month. This covers basic check-ups, medications, and other medical needs. This is a very important part of sponsorship as medical care is difficult to come by in Zimbabwe. Sitting in the heart of Chiredzi are the Chiredzi Christian Home and Chiredzi Christian Children's Village. These facilities are designed to eventually provide loving care for up to 120 orphans. Children are placed in "families" each with their own living quarters. These families are under the oversight of two full-time resident Christian women. The maximum size for an one family is ten children. Since the children are expected to remain in the orphanage until they finish high school, these family units are vital in providing a secure and homelike environment. The women are called, respectively, "mother" and "aunt." Food, an ongoing and serious challenge these days in Zimbabwe, is an expensive but vital part of the care provided. Clothing and medical care are also provided. Education is provided first grade through high school. The extent of the AIDS crisis in Zimbabwe staggers the imagination. According to the World Health Organization, 33.7% of adults in Zimbabwe are infected with AIDS. Nearly 200,000 die each year. The current life expectancy in Zimbabwe is less than 38 years. Looming behind these statistics is another, and perhaps even more tragic, crisis. The children left behind as mothers and fathers die has outstripped family, village, and government resources. One out of twelve people in Zimbabwe is a child who has lost at least one parent to AIDS. More than twenty thousand children have lost both parents. 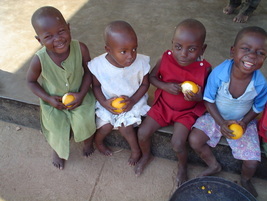 90% of orphans in Zimbabwe are the result of AIDS.